Yikes, right?! Yeah even just looking at this makes me a little embarrassed and somewhat anxious too, as I really do love organization and everything in its proper place, and this is certainly not organized. Well, lately I happened on a complete lifesaver for getting my work space more organized, especially my post-its! 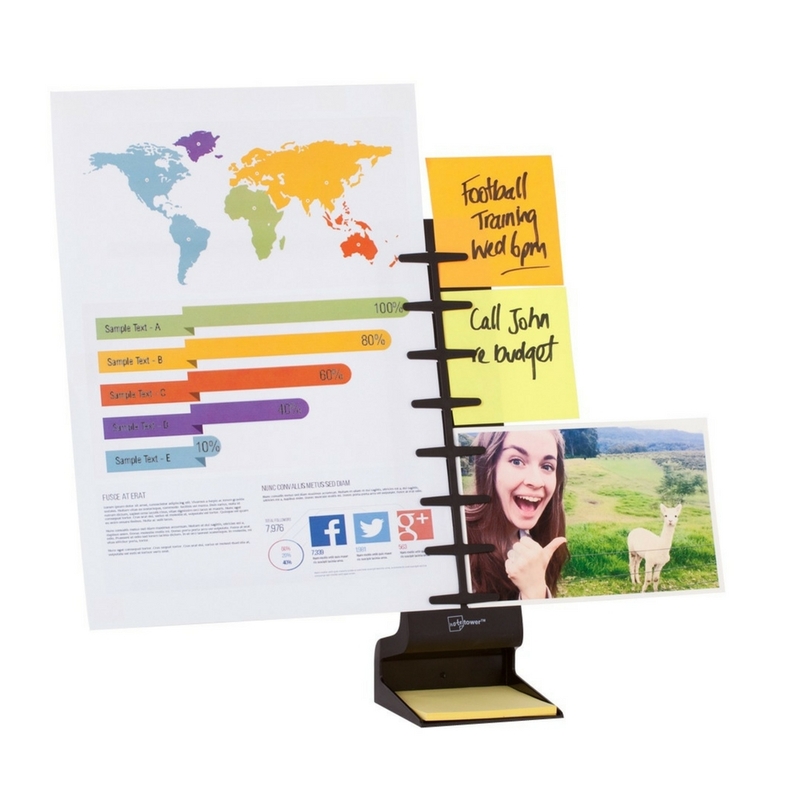 The NoteTower Desktop Pro Sticky Notes Desk Organizer does just that! It organizes your post-its, print-outs, index cards, and any other paper you need to keep right in front of you! 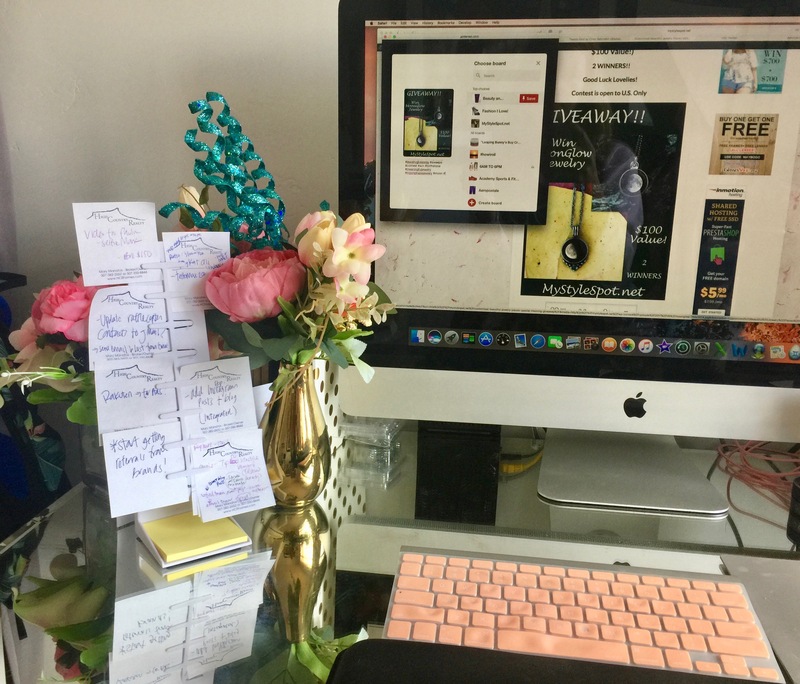 With the NoteTower Desktop Pro, I can have my post-its handy and right there for me to see, but without looking like a huge disorganized mess! The NoteTower Desktop Pro is innovative and addresses this common problem many of us have but have never been able to find a solution to! Although there is the perennial push for the paperless office, with well over 80 Billion Sticky Notes sold throughout the world last year, those little sticky notes are everywhere and can be difficult to manage, and I can certainly attest to that! I spend more on post-its than all of my other office supplies – combined! 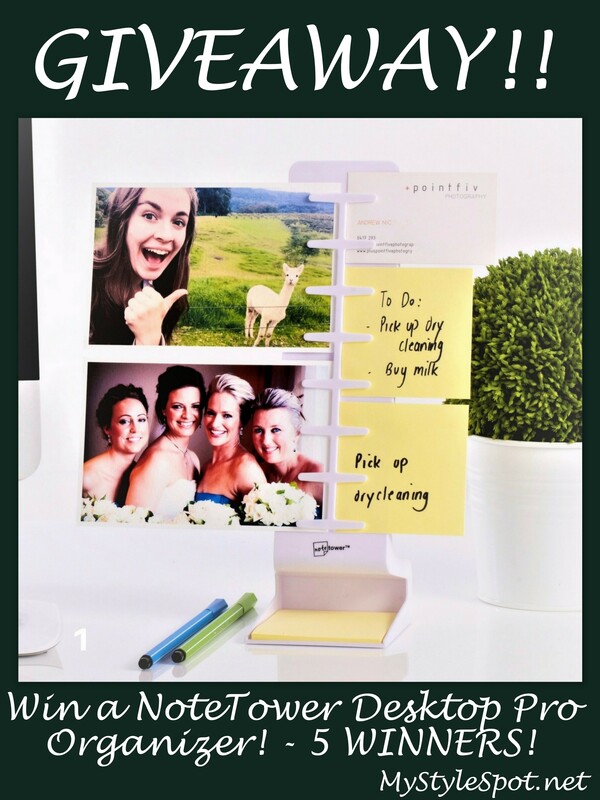 The NoteTower Desktop Pro makes organizing sticky notes far easier and has the added benefit of being able to display favorite photos, copy paper, business cards and more. Simply slide the paper item into the flexible clips (it has over 20 in total) and the NoteTower Pro organizes and displays the item in direct view. It also has handy folding arms you can extend from the rear to support heavier copier paper or photos in both the landscape and portrait positions. The NoteTower Desktop Por also has nano-suction pads at the base to provide a temporary bond to your desktop, so it won’t slide around or fall on you, but instead, keeps your notes and papers securely in place. It also leaves no residue behind and can be used again and again, wherever you end up deciding to place it! If it ever becomes dirty or loses its adhesiveness, simply rinse with water, wipe and let dry then reuse normally. By providing a central location for your notes and photos, the NoteTower Pro will Un-clutter your desk, Maximize your workspace and Keep you organized. And one major benefit I’ve noticed, is I seem to be calmer at my desk and not as anxious. 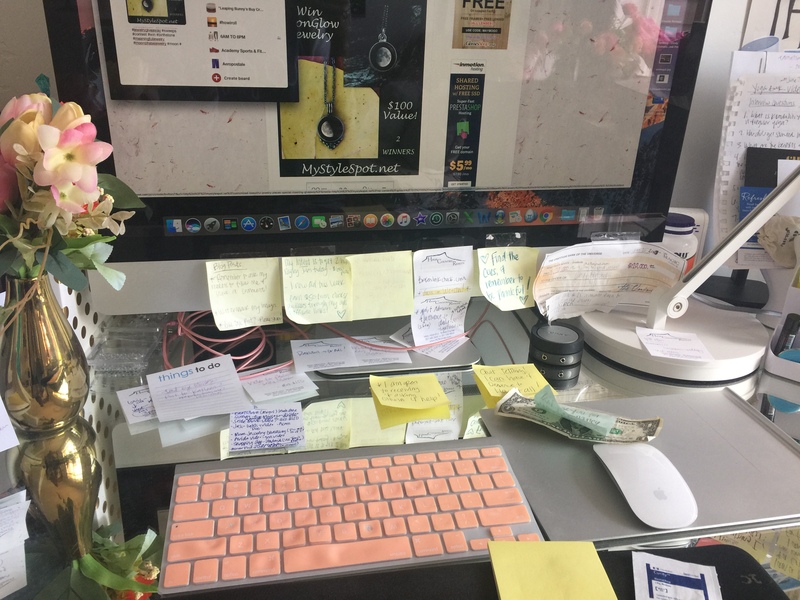 I am not scrambling through sticky notes looking for that one specific website I need, and looking at my space now just makes me feel happier. It looks beautiful and in a weird way, makes me feel like there is not as much work piling up on me as I have previously thought! The NoteTower Desktop Pro is made from recyclable ABS plastic, and makes typing documents and data entry a breeze and is ideal for the home and/or office. And the best part is that it does this without any damage to your documents or valuable photos. There is no need for messy tape, glue, pins or tacks! It is Compact, Safe and Easy to Use! Keeping an organized desk has finally been made fun and easy! Ahh, I feel much more peaceful just looking at it, as you can imagine! I didn’t realize how chaotic my work space was looking with random post-its all over my desk, computer, etc, but it’s looking so much better now! Watch this cute video Here to see the NoteTower Desktop Pro in Action! Check it out at NoteTower.com. Get it Here on Amazon for just $11.89 and Only $9.89 for the Mini! Both Available in Black or White. Oh, and purchase includes 50 sheets of standard 3×3 inch yellow sticky notes since the makers of the NoteTower Desktop Pro know just how much you love your sticky notes! Also, the lovely people of NoteTower are letting me Give 5 of these away! ENTER TO WIN a NoteTower Desktop Pro Organizer in the Rafflecopter form below! This would be for my husband, right now he has post its and business cards scattered everywhere. I have a large filing cabinet, as well as many drawers that help keep me more organized. I could always use more help. I have post it notes posted everywhere and also a binder to reminds me of things. Post its are everywhere.. it is anything but organized! I don’t! I have stuff everywhere! I want to be more organized. I have a file cabinet to organize papers.